Although Pacific Islanders and Asians dominate Hawaii’s immigrant population, there is a sizable settlement of Europeans (Brits, Scots, Russians, Germans, Spaniards and Portuguese) on the islands. Portuguese cuisine is especially popular in Hawaii as the people shared their cultural cooking customs at the historic plantations. We especially love their donuts (malassadas), sweet bread (pão doce), sausage (linguiça) and bean soup served in several restaurants and food trucks. 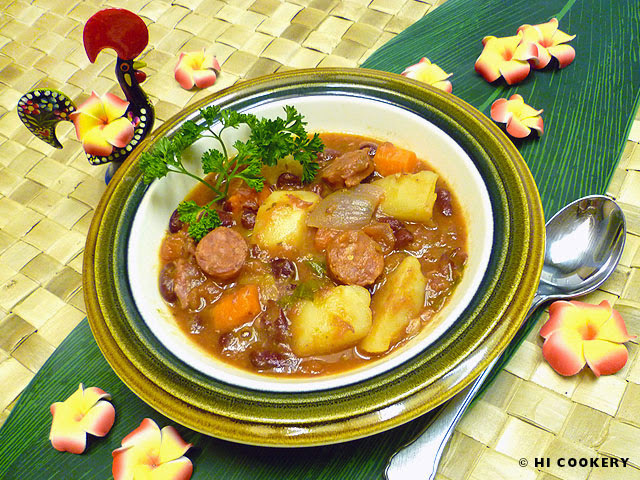 This blog post presents a slow cooker recipe for Portuguese bean soup, a hearty stew of linguiça, ham hocks, vegetables and kidney beans. Portuguese bean soup is perfect for cold winter days, during January’s National Soup Month and National Slow Cooker Month and on National Bean Day. Line a 6-quart slow cooker with the appropriate cooking bag. 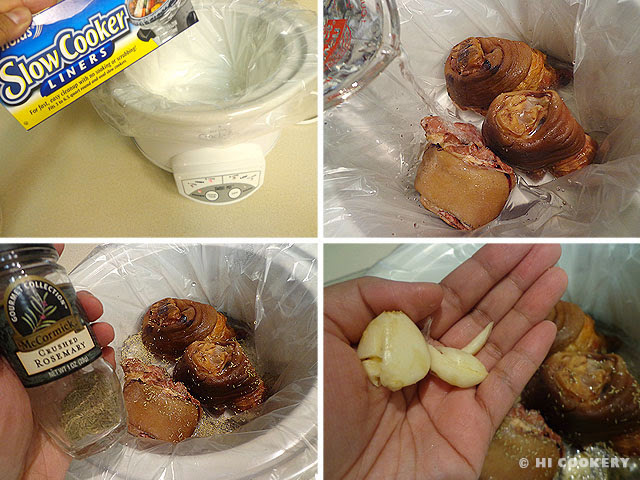 Place the ham hocks in the crock pot and pour water over them. Sprinkle rosemary and crushed garlic. Chop the cilantro and add to the crock pot. Cover with the lid and cook on low for at least four hours until the ham hocks are tender. 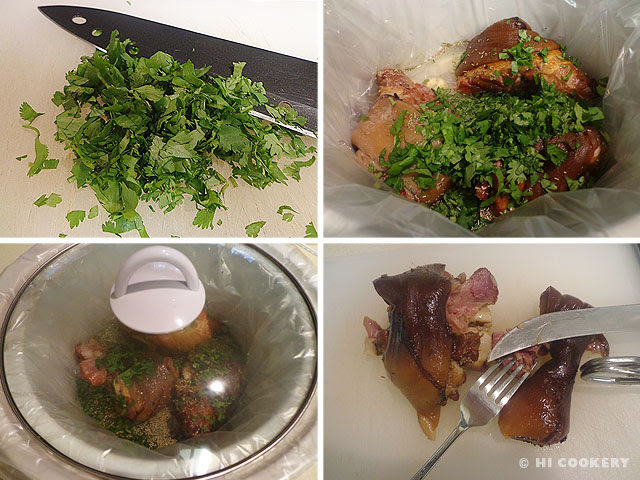 Remove the ham hocks from the crock pot and slice off the meat, discarding the bones and fatty skin. Return to the crock pot and add the remaining stew ingredients. 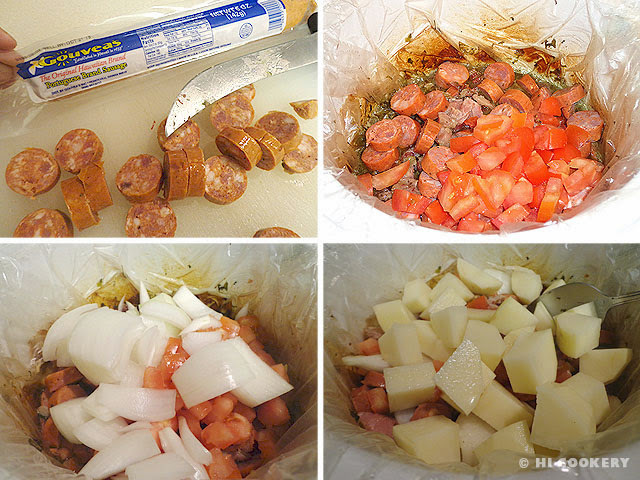 In the crock pot, add the sliced Portuguese sausage, tomatoes, onions and potatoes. 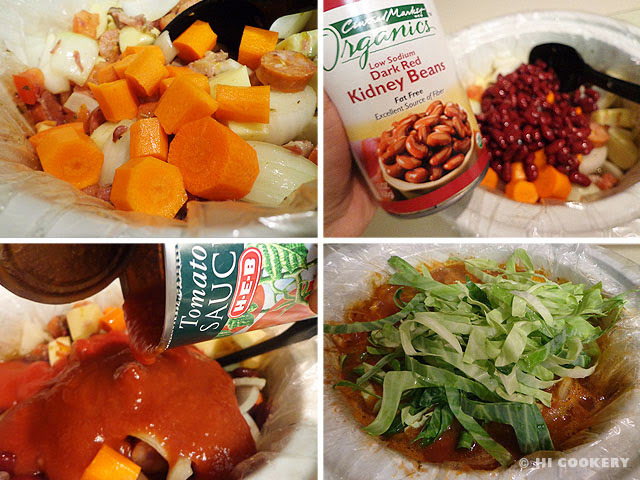 Mix in the carrots, kidney beans and tomato sauce. Stir until blended. Cover and cook on low for 6-10 hours or until the vegetables are tender. Stir in the cabbage, cover and cook for another 30 minutes or until the cabbage is soft. Ladle the stew into soup bowls and garnish with a sprigs of fresh cilantro or parsley. Serve hot with Portuguese sweet bread or over steamed white rice. Obrigado (thanks) to Lisa L. for the San Miguel rooster prop in the final food photo above that she got for us in Portugal. She also used to be stationed in Hawaii years ago and is back this year for a few months working for the U.S. Navy. Lucky for her, she gets to eat Portuguese bean soup and other authentic local-style foods in Islander’s home state! Other versions of the Portuguese bean soup recipe include macaroni to add texture and thickness to the broth.